Maybelline - Eyestudio - Lasting Drama Gel Eyeliner. 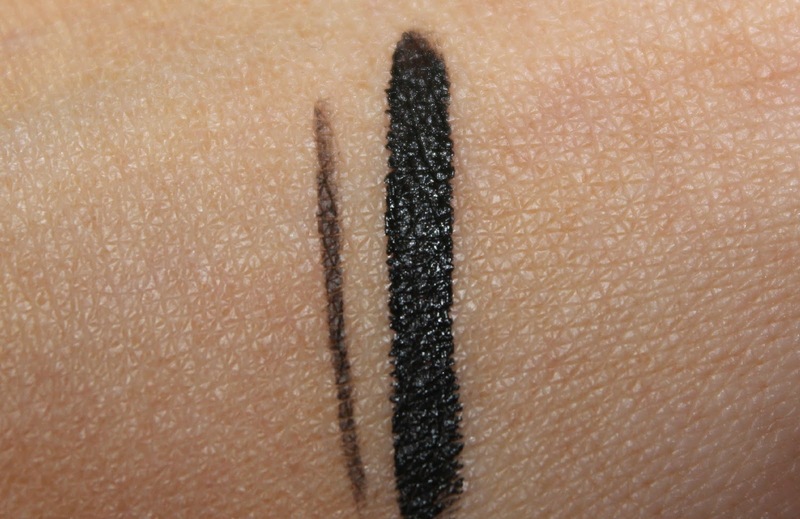 So last week I picked up a new gel eyeliner from Maybelline in the colour 01 intense black. Retailing at just £7.99, which I don't think is that bad at all to say how pretty the packaging is and the fact that a brush is included. Now I don't own that many products from Maybelline if I'm completely honest. Nothing usually pops out at me when I'm near their stand, but after trying this I will definitely be looking at more products from their range. Applying the eyeliner was super easy! I don't know if it's the brush or just the consistency of the product. I've never been one to perfect the winged eyeliner look, but even the first time I applied it I had to look in the mirror again as it didn't look like my usual messy eyeliner and let me just say a little goes a long way. I was surprised at how pigmented the eyeliner was after just one swipe and at how quickly it dried after just being applied. As you can see in the bottom picture the left swatch is applied really light and thin where as the right hand swatch is applied a little heavier. Now I do tend to have oily eyelids which is really annoying *sigh* so I can be quite picky when it comes to eyeliners, but the staying power of this eyeliner is amazing! I've worn it everyday going from early starts to really late nights and there's not been a smudge in sight. I'm quite amazed! Now I know why it get's compared to the higher end gel eyeliners such as the one from Bobbi Brown. Maybelline Lasting Gel Eyeliner is by far my favourite drug store eyeliner, there's not another eyeliner that comes close. So I'd just like to say thank you to some of the girls who recommended this product to me last week via Twitter. I seriously haven't had it off since. Do you prefer gel to pencil like me? This is the one I use and I love it so much ! Ok this sounds like something I need to try!! I've never tried gel liner as I don't get on with liquid! I really want to though, the pigmentation looks amazing! I store mine upside down (it's suppose to stop it from drying out). I'm never without my flick of black eyeliner and I've been loyal to the Collection's Fast Stroke one for years (at £2.99, I really can't complain!) but your review has seriously made me consider branching out and giving this one a go! Honestly you really need to try this one! It's so so good! My all time fave drugstore gel liner! Amazing stuff.